Paired with striking, contemporary illustrations by artist Hallie Heald, The Women Who Made New York offers a visual sensation--one that reinvigorates not just New York City's history but its very identity. Julie Scelfo is a frequent contributor to "The New York Times," where her stories about how we live routinely top the "Times " most e-mailed list. Prior to joining the "Times" in 2007, Scelfo was a correspondent at "Newsweek," where she covered breaking news and wrote about society and human behavior. She covered the events of September 11, 2001, live from lower Manhattan, and then reported extensively on the attack s emotional and environmental aftermath. Scelfo lives with her family in Brooklyn, where she rides a push-scooter to ease travel back and forth between neighborhoods. She is a member of PEN America, a supporter of Narrative 4, and believes radical empathy is where it's at. More information about her work can be found at juliescelfo.com. Hallie Heald is a freelance illustrator and stylist living and working in New York City. She's worked as an intern for NY designer Nanette Lepore, was an assistant designer and stylist making faux leather handbags, and has been a face painter for fancy birthday parties in Santa Barbara. You can follow her at hehdesignsny.com. "Forgetting-and belatedly remembering-women is a historiographical tradition as old as history itself. 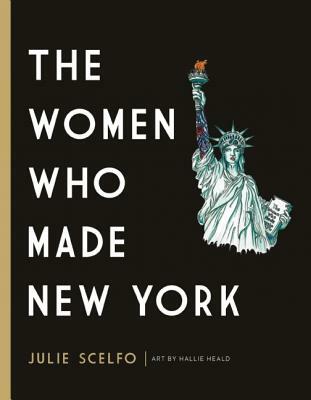 The Women Who Made New York positions itself as an antidote to that process...With its romantic illustrations and requisite three pages dedicated to Joan Didion, it would be easy to dismiss The Women Who Made New York as mere gifting bait for anyone with a niece at Barnard College. (And to be clear, your niece probably will love this.) But for every tale that makes you pump your fist in triumph, there is one that makes you clench your jaw in anger." "From artists to activists, an homage to the unheralded hands and hearts who built one of humanity's most iconic cities... Rigorously researched and elegantly written." "This book on New York City history is more than a pretty cover. It is a testament to the lives of impressive women in the Big Apple." "Paired with striking illustrations by artist Hallie Heald, The Women Who Made New York offers a visual look at some of the most vibrant women in the history of one of the world's most vibrant cities."